This comfortable and unique business center offers a relaxed and focused working environment ideal for professional tenants of any industry or commercial background to setup and immediately be both productive and efficient. Providing a range of corporate services and business benefits to all occupying tenants as standard, including high speed internet connections, flexible terms, valet parking and an ideal location; this center is a fantastic choice for office solutions. 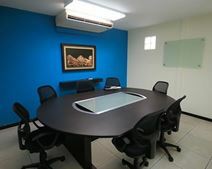 Office space available in a modern business centre in El Salvador. This prestigious centre is based in two modern towers, and boasts a range of features, including business lounge, meeting rooms, underground parking, CCTV security, disabled access, and an on-site restaurant and sandwich/coffee bar. The buildings are strategically located in San Salvador's business area, and are directly linked to the Radisson Hotel.